Possibly the world is now living off an oil plateau—roughly 75 million barrels of oil produced each and every day—since at least 2005. 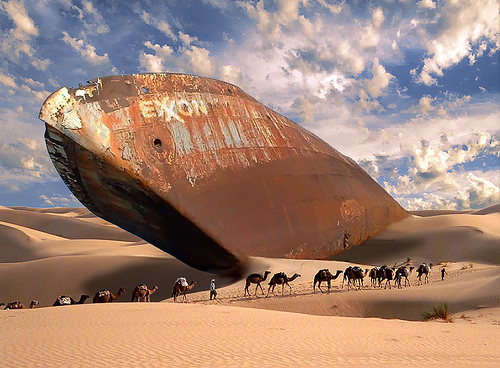 The first trillion barrels of oil have been consumed, another trillion is still waiting in the earth. However, getting the next trillion is likely to cost a lot more than the previous trillion. Based on an analysis of oil data from the U.S. Energy Information Administration it can be concluded that since 2005 production has remained essentially unchanged whereas prices (a surrogate for demand) have fluctuated wildly. This suggests that there is no longer any spare capacity. The difference between this plateau of 75 mb and the actual production of 82 mb in 2010 can be explained by the production of “unconventionals”—Canadian tar sands or the natural gas liquids co-produced with oil extraction. Others like environmental scientist Vaclav Smil however argue against the existence of a plateau since the oil price, adjusted for inflation, is virtually the same as in 1981. And that enough oil has been produced to satisfy demandsof new consumers in India and China. Against that idea it can be argued that energy effficiency has greatly increased during that period.